Read ’em and weep, folks. This could be your next Concordia Student Union. Late on Monday night, a small handful of Concordia student politicos shuffled about, whacking posters to cork boards around the downtown campus. While “poster nights” of old gained infamy in years past, as mobs of students supporting competing slates swarmed the Hall Building fighting for poster space, the 2013 edition started calmly at around 9:00 p.m. on Monday, ushering in another season of CSU elections. Students who have been around this university for a few years might notice a relative lack of posters on the walls. 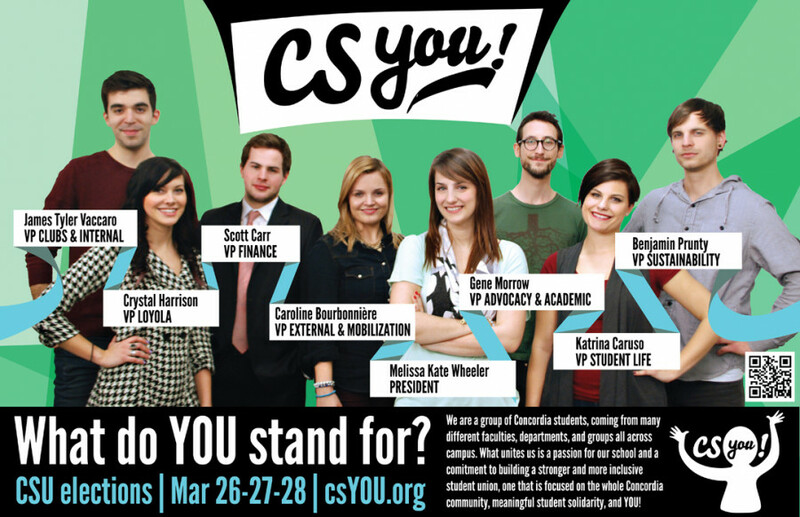 There is only one team running this year, and they’ve coined themselves CSYou. Though the official slate system was abolished last year, candidates are still able to run together as a team. However, each candidate is elected on their own. There are only two independent candidates running head-to-head—for the contested positions of VP Finance and VP Student Life. Wheeler, one of council’s more outspoken members, will almost certainly be Concordia’s next student union president as she’s running uncontested. She has been a fairly vocal critic of this year’s executive and was heavily involved in the “Love Doesn’t Hurt” campaign against abusive relationships. Two-time senator Morrow is an academic activist with an inscrutable Twitter handle (@Replqwtil). Morrow is one of the most talkative senators, and has championed topics such as online learning reform and independent students’ (or lack there of) representation on Senate. He was also an active member of the student strike movement. Caruso was only recently appointed as an ex-officio CSU councillor for fine arts students. She also is the Editor-in-Chief of the Concordia Undergraduate Journal of Art History, and is pursuing a joint major in art history and studio arts. Running in one of only two contested positions, Scott Carr is pretty new to the Concordia student political scene. As a John Molson School of Business student, however, he’s carved a name for himself with multiple awards to his name. Harrison is in communications studies and is currently VP Internal & External Affairs for COMS Guild. She lives in Nôtre-Dame-de-Grace, and as an NDGer, she wants to find ways to lure Sir George Williams students to the far-off land of Loyola. Prunty is currently the VP External for the Liberal Arts Society, elected recently in the December byelections. He’s hoping to get more students to participate in undergraduate politics, and is also a board member for the Sustainability Action Fund. Tardivo-Martin is an international business student and current CSU councillor representing the John Molson School of Business. 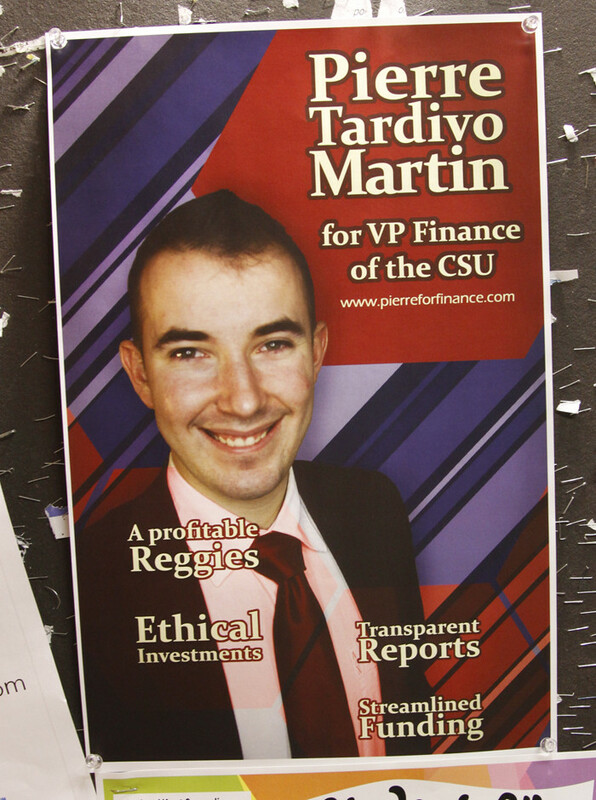 He’s running as an independent for VP Finance, one of only two contested positions. Rajaonarivelo is a commerce student and current CSU councillor representing the John Molson School of Business. He’s running as an independent for VP Student Life, and is treasurer for the Tau Kappa Epsilon fraternity. Uopdate: This article originally stated Katrina Caruso is pursuing a double major in fine arts and art history. In reality, she is pursuing a joint major in art history and studio arts. The Link regrets the error.